A year ago, I constantly felt discomfort in my body. I often felt tired and gradually lost weight. Then lumps appeared in my neck and sometimes I went into coma suddenly. My family worried about me so much. Later, I went to local hospital for examination and was found with swelling lymph nodes, which was suspected as lymphoma. The local doctors suggested surgery. I was overwhelmed by depression, fear and anxiety. After much deliberation, I finally refused that treatment plan. I believed there are other better treatment methods, which can eliminate my painfulness and kill this lymphoma. From then on, I kept seeking for effective treatment. Occasionally, I heard about Modern Cancer Hospital Guangzhou from my friend’s side. This hospital has minimally invasive therapy, which can control the condition with only a tiny incision on the patient’s body. Therefore, I went to its Jakarta office under my son’s company for further consultation. After learning about this hospital, we decided to go to Guangzhou, China for treatment. Although I had no idea what treatment effect I was going to get there, I would not give up such a chance. Actually, I had well prepared for the fight against this disease. 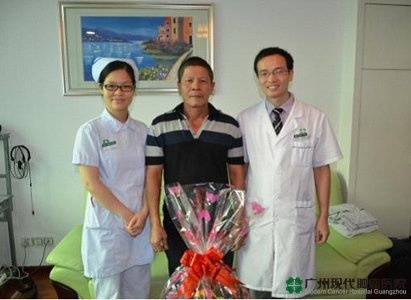 26, March, 2012, I started my one-month treatment in Modern Cancer Hospital Guangzhou under my son’s company. The 30 days was really a bitter experience, which was all about injections, medicines, examinations and treatment. Fortunately, I had my son’s company and the intensive care of the doctors and nurses, which strengthened my mind of fighting against cancer and gave me courage to cooperate with the treatment regardless all the painfulness. After my admission in Modern Cancer Hospital Guangzhou, doctors arranged a thorough examination for me, which diagnosed me with 4 stage non-Hodgkin's T-cell lymphoma with multiple metastases. I was told that my condition was very dangerous. My attending doctor,Tang Xiangzhuan, together with chief doctor Dai Wenyan and other oncologists held a consultation to work out the treatment plan for me. Considering that I did not want to undergo surgery, they decided to perform interventional therapy to me. Before the treatment, Dr. Tang explained to me about the details of my condition and the interventional therapy, including the reaction my body may have after the treatment. His introduction gave me great comfort and eliminated my worry. After two sessions of interventional therapy, my condition was obviously improved. I felt no side-effect after the treatment, except for feeling a little heat. My energy also came back. Such treatment effect gave me hope of life. On 27 April, I discharged from the hospital and decided to go back home for rehabilitation. Dr. Tang prescribed both Chinese and Western medicine for me and told me the details of dietary and life management. I have won the first round of this battle. For the next round, I believe I will win too. During the following four months, from May to August, I went back to Modern Cancer Hospital Guangzhou 5 times for return check. Every time, I spent about one week there. At my third return visit, my weight obviously increased by 10kg. Compared with my status before the treatment, when I was very thin, my complexion has become as normal as that of healthy people. 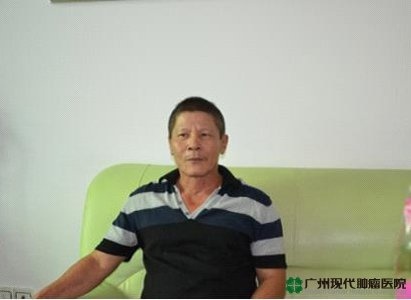 At my return visit in August, I done two sessions of radioactive seeds implantation, which removed the metastases in other parts of my body, only remaining some rudimental cancer cells in the neck. Every time I went back to the hospital, I was settled on the fifth floor, where I got acquainted with many other wardmates. Most of them were from Jakarta, Indonesia. Some others are from Vietnam, Thailand, Philippines and other countries. They are all cancer patients. Generally, most early and mid-stage cancer patients have chances to survive. However, for advanced cancer patients or those who with metastasis, the main purpose of treatment is to eliminate their painfulness and prolong their lives. To fight against cancer, attitude is very important. 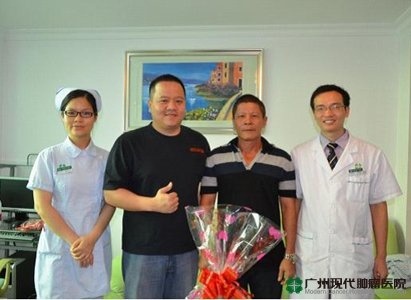 Surprisingly, Modern Cancer Hospital Guangzhou always cares about patients’ mood and organized tourism activities for patients to breathe the outdoor living air every week. I like these activities very much, through which I got acquainted with new ward mates. We communicated with each other, encouraged and cheered up each other. It was very pleasant and enabled us to sense our valuable lives. It was amazing to encounter such a great hospital, whose treatment technology and medical services satisfied my a lot. 27 August, I discharged from the hospital smoothly. I couldn’t wait to fly back to Jakarta to see my children. I am grateful of Modern Cancer Hospital Guangzhou for its care and consideration. I also want to send my regards to the medical personnel of this hospital, who have given me intensive care. Thanks again.